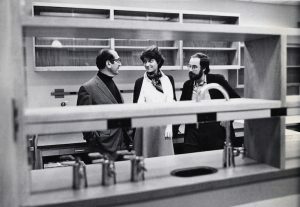 Nancy Hopkins with Salvador Luria and David Baltimore at the MIT Cancer Center. Courtesy MIT Museum. A donation of the papers of Mildred Dresselhaus, late Institute Professor Emerita of Physics and Electrical Engineering and Computer Science, is also forthcoming. Dresselhaus, whose work paved the way for much of today’s carbon-based nanotechnology, was also known for promoting opportunities for women in science and engineering. Discussions with additional faculty are also underway. Acquisitions of MIT administrative records provide additional context to the personal archives and a broader view on issues of gender equity and the challenges faced by women in academia. The next phase of the project will continue to manage donations, prepare collections for use, and enlarge this core group by reaching out to women faculty who were tenured in the 1960s, ‘70s, and ‘80s.